San Ysidro border crossing between San Diego, California and Tijuana, Mexico. Courtesy Magnusson Klemencic Associates. San Ysidro border crossing, view from head house. Courtesy Magnusson Klemencic Associates. 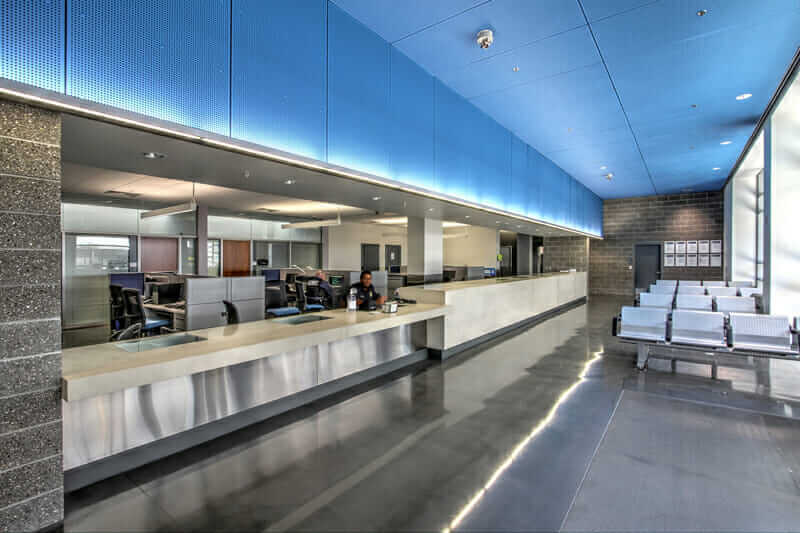 Miller Hull, the architect contracted for the renovation, and its client, the GSA (the General Services Administration branch of the US government) set out to create a more hospitable gateway for people coming from Mexico, while also meeting stringent security requirements. “A border crossing is a necessary thing,” says Rob Misel, principal in charge of the San Ysidro Land Port of Entry project at Miller Hull. But whether it is intimidating and scary or welcoming and pleasant depends on the design. 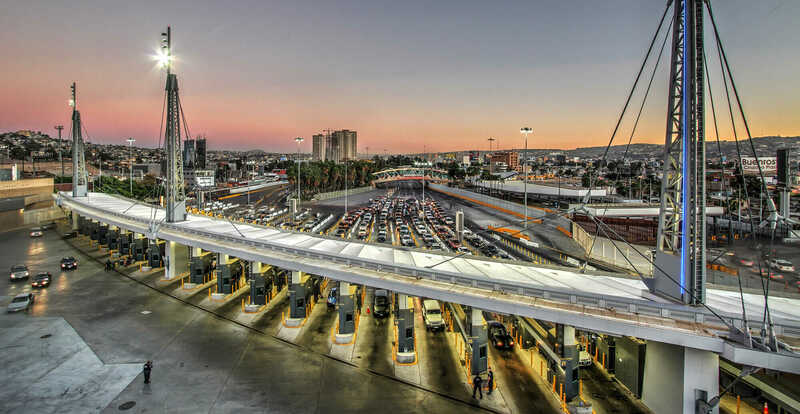 The original San Ysidro crossing was designed in the 1970s and is unable to keep up with the increase of travelers and the changes in security requirements. The design team—which used Autodesk Revit for structural, MEP, lighting, and security, as well as AutoCAD for civil and landscape—was tasked with giving the crossing a major makeover in terms of the experience of its users, but they also had to make it function better. The original crossing was a fixed size, and was never designed to accommodate the large numbers of people that now pass through it every day. The crossing became so congested that at one point that before the renovation, travelers faced wait times of three or four hours. The main goals of the renovation were to “protect the officers and keep the traveling public safe as they move through it quickly,” Misel says. “We wanted to create a facility that worked well for all its users. 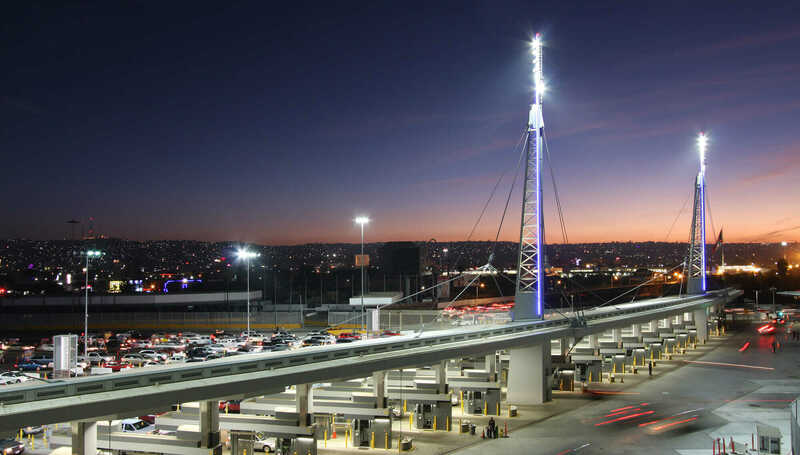 The new facility is designed to accommodate an 87 percent increased vehicle capacity by 2030.” And with improved flow of traffic, as well as better accommodations for staff operations, the current wait times at San Ysidro have dropped to an average of 30 minutes. Part of improving the wait times was accomplished by separating San Ysidro’s functions. While primary inspections still all happen under the main canopy, secondary inspections are separated out, directed into a different canopy so as not to impede the flow of travelers. 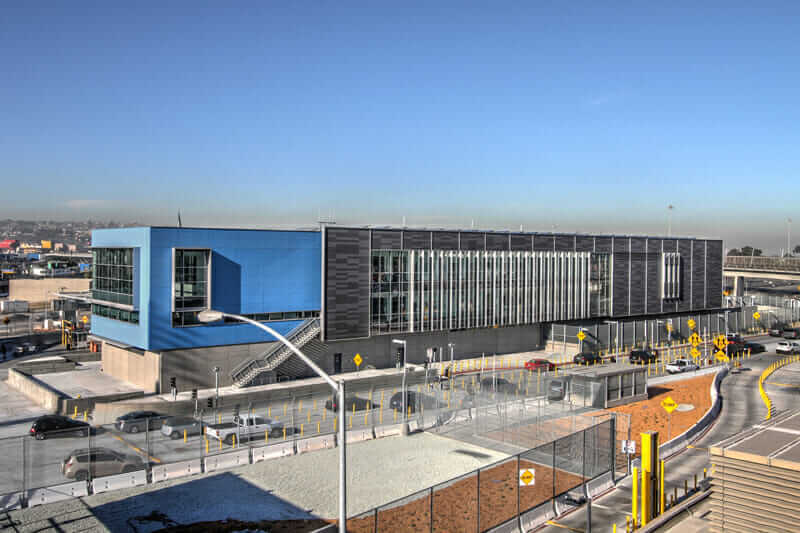 The head house, which allows officers to surveil the entire border crossing, is built above ground level, and the renovated detention center is underground. This helps keep the majority of travelers moving through while holding those that need to be detained in separate area. 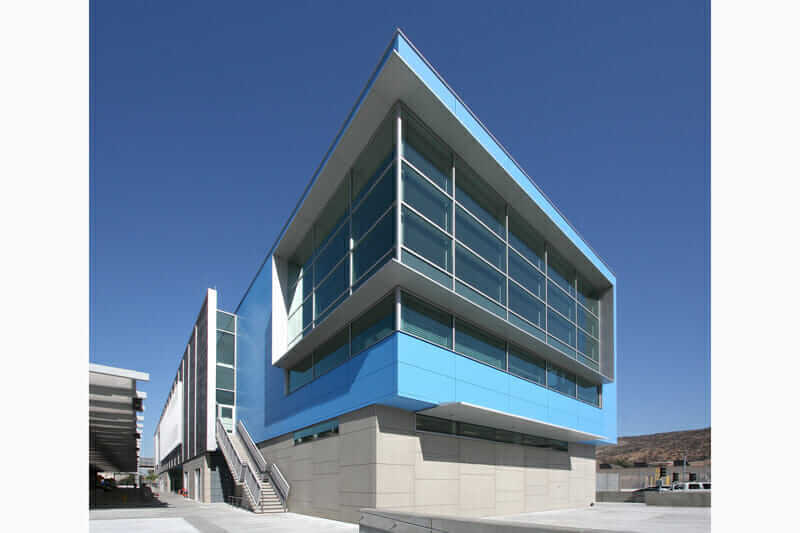 “We used architectural massing in innovative ways to achieve our design goals,” says Riske. To begin, the design team used massing—which refers to how a building’s form and mass is perceived—to serve as a visual cue to give people an understanding of how the facility works at a first glance. “In a convoluted and visually confusing setting, the prominent and highly visible Port of Operations Building anchors the nearly 50-acre complex, with 100-foot masts extending from the elegant and arcing primary inspection canopy structure presenting as an iconic gateway,” explains a Miller Hull statement about the project. The canopy also features a distinctive art-in-architecture project by J. Meejin Yoon from Höweler + Yoon Architecture, which is incorporated into the leading edge of the shade structure and dynamically reacts through an animated LED lighting array to the movement of traffic approaching in each lane. “It serves as a gateway and provides a memorable marker for this access point into the country,” Misel says. San Ysidro border crossing. Courtesy the project’s structural and civil engineering firm, Magnusson Klemencic Associates. The team used an innovative product called ETFE (Ehtylene Tetrafluoroethylene) to achieve both cover and openness with the canopy. “Pillows of ETFE, filled with air, link all the canopies together and provide a lightweight means of enclosure, reduce the depth of the structure, allow for lots of daylight to pass through, and yet provide much needed shade,” Misel says. Besides sheltering travelers from the sun, the canopy also provides relief for its officers from the heat and the toxic exhaust from idling cars. “Shading was a big requirement for the officers working in the intense sun all day,” Misel says. The translucent ETFE provides shade while also keeping the space well-lit, 24 hours every day, with a night-lighting system that bounces off the canopy. The canopy is also outfitted with an HVAC system that delivers a curtain of fresh air to cool the area down and offset the high CO2 levels from idling vehicles. San Ysidro border crossing head house lobby. Courtesy Magnusson Klemencic Associates. San Ysidro border crossing head house exterior. Courtesy Magnusson Klemencic Associates. 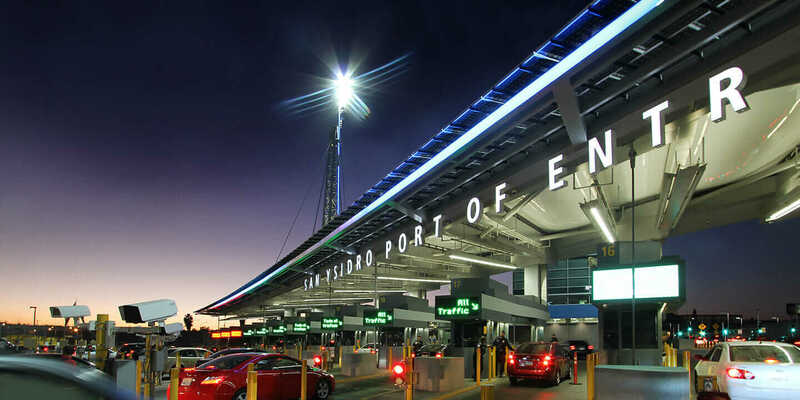 The San Ysidro renovation, slated for completion in 2019, covers 450,000 square feet of built space and a whopping 150,000 square feet of canopy space. With its emphasis on innovative design and efforts to create a healthy environment, including a goal of being a net-zero facility, the three-phase project has achieved LEED Platinum certification for phase one and is targeting Net Zero for the entire project.